Eden Gardens has lost out again. The historic venue in Kolkata, which by-passed hosting of the second Test during New Zealand's latest tour to India in a bid to complete preparation for the upcoming World Cup, has been deemed 'not ready' for cricket's flagship event. Eden, which was scheduled to host four matches - on February 27, March 15, March 18 and March 20 -- in the World Cup, lost out on what was its main fixture because of delay in construction. The last international match played in Kolkata was the second Test between India and South Africa in February last year, while the last ODI game that involved the hosts against Sri Lanka (December 2009) had witnessed a lengthy power failure. Even as the fate of the remaining matches at the venue hangs in balance, rediff.com takes a look at the three memorable World Cup matches that the historic ground hosted. The poignant images of Vinod Kambli crying will remain in Indian fans' minds forever. It seemed a perfect stage for India, with opponents Sri Lanka being restricted to 251 and the hosts 98 for one, cruising to what seemed a comfortable win. Then the script went for a toss. 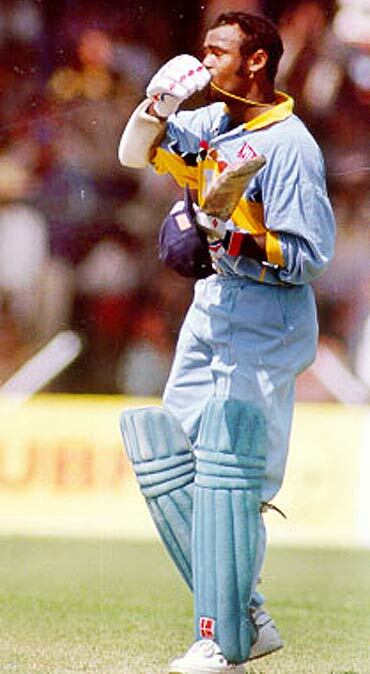 The ball started to spin and Sachin Tendulkar (65) was smartly stumped by Romesh Kaluwitharana off the bowling of Sanath Jayasuriya. In no time, India had collapsed from 98 for one to 120 for eight. The crowd lost patience and what followed was rioting in the stadium. The match was stopped and Sri Lanka were declared winners by default. The end result was a shame which the country has to live with forever! The two teams playing the final had altered the script quite a bit. The connoisseurs of cricket had been expecting a dream final between arch rivals India and Pakistan. However, while England accounted for India, a resurgent Australia got the better of Pakistan. 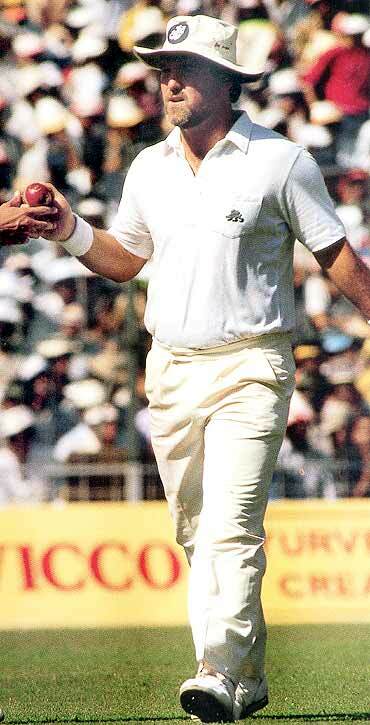 It was a second appearance in the final for both the teams and Allan Border didn't want to take any chances. The moment he called it correctly, he had no hesitation in opting to bat first -- the team from Down Under was always comfortable setting targets. And David Boon (75), who had been in prime form throughout the tournament, ensured his captain's decision was vindicated. The opener first put on 75 for the opening wicket with Geoff Marsh (24) before putting in another 76 runs for the second wicket with Dean Jones (33). The foundation had been build and the Australian middle order carried on the good work to post what seemed a formidable total (253-5). It wasn't a surprise when Boon was named the man-of-the-match eventually. Chasing a formidable target, the English team got off to a disastrous start when Craig McDermott trapped Tim Robinson (0) plumb in front with just a run on board. Graham Gooch (35) and Bill Athey (58) added 65 for the second wicket before the latter was joined by his captain, Mike Gatting (41). The duo had added 69 for the third wicket and all seemed well for England when the English captain went for a impetuous reverse sweep off his opposite number's bowling. The attempt boomeranged, Gatting getting a top edge instead and stumper Greg Dyer making no mistakes. That was the leeway that Australia had so desperately required. And despite a valiant run-a-ball 45 by Allan Lamb, England ended up seven runs short. 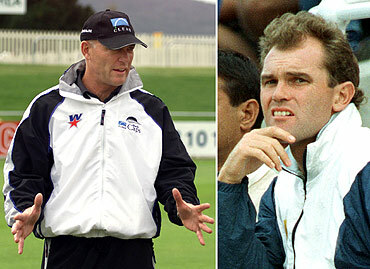 Allan Border had achieved what Ian Chappell had failed to and the team from Down Under had won their first world title. It was a match in which the Crowe siblings performed in tandem. The first match between the two teams -- at the Lal Bahadur Shastri Stadium in Hyderabad -- had witnessed New Zealand scraping through by just three runs. However, what remained etched in a fan's memory was Dave Houghton's valiant 142. The second face-off happened after a fortnight and was a must-win game for New Zealand. To their credit Zimbabwe, batting first after losing the toss, posted a good total (227-5) riding on useful contributions by Kevin Arnott (51), Andy Pycroft (52) and of course Houghton (50). And then they had the Kiwis in trouble -- at 56 for three. However, at this stage came together the Crowe brothers (Jeff and Martin). 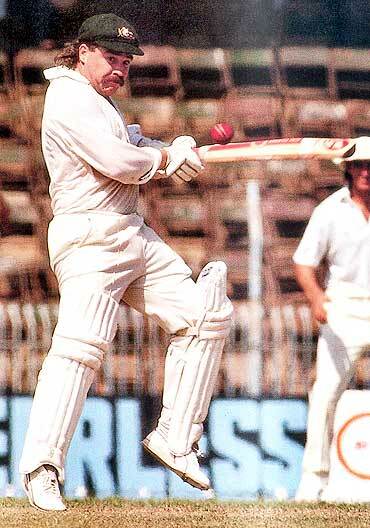 While Jeff Crowe was captaining the team, Martin was the team's main batsman and much was expected from him especially after his 72 against the same opponents in the earlier match. The brothers didn't disappoint their teammates, putting on 69 runs for the fourth wicket and taking New Zealand ever so close to a win. Martin's run-a-ball 58 was a masterclass. However, it was his elder brother who had played a sheet anchor's role to perfection, his unbeaten 88 taking his side home. The latter was named the man-of-the-match after New Zealand romped home by four wickets.